The ASP.NET PDF Viewer control supports viewing, reviewing, and printing PDF files in ASP.NET Web Forms applications. The form-filling support provides a platform to fill, flatten, save, and print PDF files with AcroForm. The ASP.NET PDF Viewer control supports viewing, reviewing, and printing PDF files in ASP.NET Web Forms applications. The hyperlink and table of contents support provides easy navigation within and outside the PDF files. The form-filling support provides a platform to fill, flatten, save, and print PDF files with AcroForm. 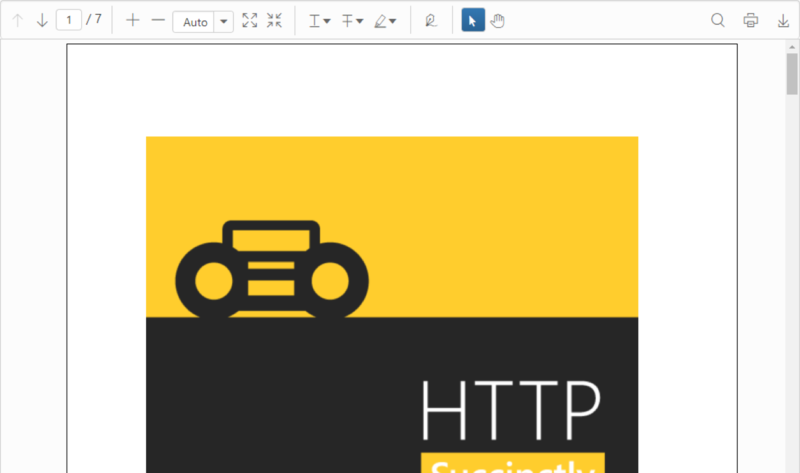 PDF files can be reviewed with text markup annotation tools. Virtualized pages - Render pages on demand to reduce initial load time when working with large PDF files. Highlight text - Highlight important texts in the PDF files. You can customize the color of the highlight or remove the highlight. Freehand signatures - Freehand signatures can be included in the pages of a PDF file. The color and opacity of the signature can be customized. Hyperlink navigation - Hyperlink navigation feature enables navigation to the URLs (website links) in a PDF file. Table of contents - Table of contents navigation allows users to navigate to different parts of a PDF file that are listed in the table of contents section. Applying theme - Choose from 13 stunning, built-in themes.